Home » News » Industry » What is Frequency Inverter? Frequency inverter also known as variable frequency drive which is for 3 phase electric induction motors. Line Voltage - In this case 3-phase AC voltage. Input Section - Consists of a rectifier and filter. Transforms the AC voltage into DC voltage. Control Section - The control board accepts real world inputs and performs the required operations. The tasks are performed by a microprocessor. Output Section - This section includes the base frequency inverter circuits and the inverter. The base frequency inverter signals are low level signals that tell the inverter to turn on. The frequency inverter is a system made up of active/passive power electronics devices (IGBT, MOSFET, etc. ), a high-speed central controlling unit (a microcontroller, like the and optional sensing devices,depending upon the application requirement. A typical modern-age intelligent frequency inverter for the three-phase induction motor with single-phase supply is shown in Figure. The basic function of the frequency inverter is to act as a variable frequency generator in order to vary speed of the motor as per the user setting. The rectifier and the filter convert the AC input to DC with negligible ripple. 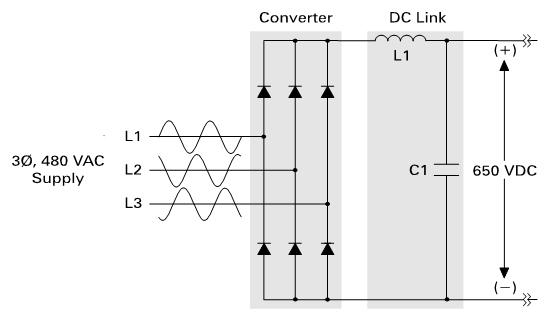 The inverter,under the control of a microcontroller,synthesizes the DC into three-phase variable voltage,variable frequency AC. Additional features can be provided, like the DC bus voltage sensing, OV and UV trip,overcurrent protection, accurate speed/position control, temperature control, easy control setting, display,PC connectivity for real-time monitoring, Power Factor Correction (PFC) and so on. With the rich feature set of the PICmicro microcontroller, it is possible to integrate all the features necessary into a single chip solution so as to get advantages, such as reliability, accurate control, space saving, cost saving and so on. The base speed of the motor is proportional to supply frequency and is inversely proportional to the number of stator poles. The number of poles cannot be changed once the motor is constructed. So, by changing the supply frequency, the motor speed can be changed. But when the supply frequency is reduced,the equivalent impedance of electric circuit reduces. This results in higher current drawn by the motor and a higher flux. If the supply voltage is not reduced, the magnetic field may reach the saturation level. Therefore, in order to keep the magnetic flux within working range, both the supply voltage and the frequency are changed in a constant ratio. Since the torque produced by the motor is proportional to the magnetic field in the air gap, the torque remains more or less constant throughout the operating range. When the voltage at each frequency is adjusted so that the ratio V/f is kept constant up to base speed, and full voltage is applied thereafter, a family of torque-speed curves as shown in Figure 8.3 is obtained. These curves are typical for a standard induction motor of several kW output. As expected, the no-load speeds are directly proportional to the frequency, and if the frequency is held constant, e.g. at 25 Hz in Figure 8.3, the speed drops only modestly from no-load (point a) to full-load (point b). These are therefore good open-loop characteristics, because the speed is held fairly well from no-load to full-load. If the application calls for the speed to be held precisely, this can clearly be achieved (with the aid of closed-loop speed control) by raising the frequency so that the full-load operating point moves to point (c). In the figure the voltage and the frequency are varied at a constant ratio up to the base speed. The fluxand the torque remain almost constant up to the base speed. Beyond the base speed, the supply voltage can not be increased. Increasing the frequency beyond the base speed results in the field weakening and the torque reduces. Above the base speed, the torque governing factors become more nonlinear as the friction and winding losses increase significantly. Due to this, the torque curve becomes nonlinear. Based on the motor type, the field weakening can go up to twice the base speed. 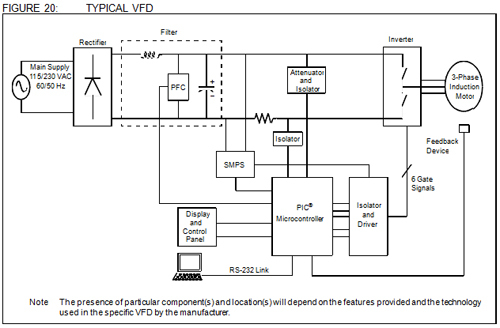 This control is the most popular in industries and is popularly known as the constant V/f control. As we know, frequency inverters are used for two main purpose: process control & energy saving. When we come to the issue of accurate process control, we know there are no other control methods on AC motor, which are better than inverters (frequency inverters).For example, full-voltage starters can only run the motor at full speed. And motor soft starts and reduced voltage soft starters can only gradually ramp the motor up to full speed, and back down to shutdown. But on the other hand,frequency inverters can be programmed to run the AC motor at a precise speed, to stop at a precise position, or to apply a specific amount of torque. This is often required for some process, such as material handling, textile. three main sectors of inverter are introduced.Without an inverter, industrial induction motors run at full speed continuously. And valves, or other mechanical methods, are employed to control the machine output. Unfortunately, running an industrial induction motor at maximum speed regardless of the varying demands of production means a great deal of electric power is wasted. Thus some of the money on energy consumption is wasted. Another benefit of inverters is the soft-start capability in which motors are ramped up to speed instead of being abruptly thrown on line.This useful feature of frequency inverter reduces mechanical stresses on the entire motor system and leads to lower maintenance costs, as well as a longer motor life. And another benefit of this solid state electrical device is improved process control.In fact better process control with frequency inverter is the original application. Since industrial process throughput in most operations depends on a range of variables, a motor that is only able to operate at a constant speed, even when one or more process variables change might contribute to creation of scrap, not to mention wasted energy. Most variable torque frequency inverters have PID capability for fan and pump applications, which allows the frequency inverter to hold the setpoint (the programmed input value) based on actual feedback from the process, rather than relying on an estimation. A transducer or transmitter is used to detect process variables, such as pressure levels, liquid flow rate, air flow rate, liquid level. Then the signal is sent to a programmable logic controller (PLC). Programmable logic controller (PLC) communicates the feedback from the process to the frequency inverter. The frequency inverter uses this continual feedback to adjust itself to hold the setpoint. High levels of accuracy for other applications can also be achieved through frequency inverters, which offer closed-loop control operation. 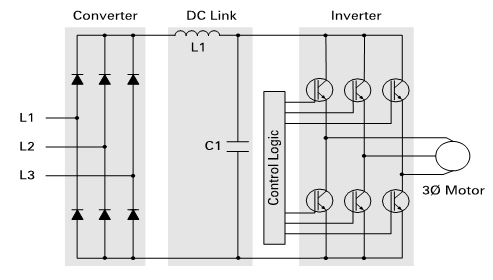 Closed-loop control can be accomplished with either a field-oriented vector frequency inverter, or a sensorless vector frequency inverter. The field-oriented vector frequency inverter obtains process feedback from an encoder, which measures and transmits to the frequency inverter the speed and/or rate of the process, such as a conveyor, machine tool, or extruder. The frequency inverter then adjusts itself accordingly to sustain the programmed speed, rate, torque, and/or position. Apart from the nonlinear characteristics of the induction motor, there are various issues attached to the driving of the motor. Let us look at them one by one. Earlier motors tended to be over designed to drive a specific load over its entire range. This resulted in a highly inefficient driving system, as a significant part of the input power was not doing any useful work. Most of the time, the generated motor torque was more than the required load torque. For the induction motor, the steady state motoring region is restricted from 80% of the rated speed to100% of the rated speed due to the fixed supply frequency and the number of poles. When an induction motor starts, it will draw very high inrush current due to the absence of the back EMF at start. This results in higher power loss in the transmission line and also in the rotor, which will eventually heat up and may fail due to insulation failure. The high inrush current may cause the voltage to dip in the supply line, which may affect the performance of other utility equipment connected on the same supply line. When the motor is operated at a minimum load (i.e.,open shaft), the current drawn by the motor is primarily the magnetizing current and is almost purely inductive.As a result, the PF is very low, typically as low as 0.1.When the load is increased, the working current begins to rise. The magnetizing current remains almost constant over the entire operating range, from no load to full load. Hence, with the increase in the load, the PF will improve. When the motor operates at a PF less than unity, the current drawn by the motor is not sinusoidal in nature.This condition degrades the power quality of the supply line and may affect performances of other utility equipment connected on the same line. The PF is very important as many distribution companies have started imposing penalties on the customer drawing power at a value less than the set limit of the PF. This means the customer is forced to maintain the full-load condition for the entire operating time or else pay penalties for the light load condition. While operating, it is often necessary to stop the motor quickly and also reverse it. In applications like cranes or hoists, the torque of the drive motor may have to be controlled so that the load doesnot have any undesirable acceleration (e.g., in the case of lowering of loads under the influence of gravity). The speed and accuracy of stopping or reversing operations improve the productivity of the system and the quality of the product. For the previously mentioned applications,braking is required. Earlier, mechanical brakes were in use. The frictional force between the rotating parts and the brake drums provided the required braking.However, this type of braking is highly inefficient. The heat generated while braking represents loss of energy. Also, mechanical brakes require regular maintenance. In many applications, the input power is a function of the speed like fan, blower, pump and so on. In these types of loads, the torque is proportional to the square of the speed and the power is proportional to the cube of speed. Variable speed, depending upon the load requirement, provides significant energy saving. A reduction of 20% in the operating speed of the motor from its rated speed will result in an almost 50%reduction in the input power to the motor. This is not possible in a system where the motor is directly connected to the supply line. In many flow control applications, a mechanical throttling device is used to limit the flow. Although this is an effective means of control, it wastes energy because of the high losses and reduces the life of the motor valve due to generated heat. When the supply line is delivering the power at a PF less than unity, the motor draws current rich in harmonics. This results in higher rotor loss affecting the motor life. The torque generated by the motor will be pulsating in nature due to harmonics. 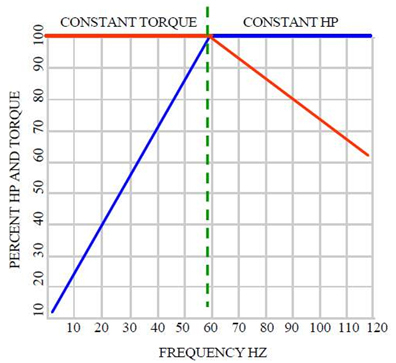 At high speed, the pulsating torque frequency is large enough to be filtered out by the motor impedance. But at low speed, the pulsating torque results in the motor speed pulsation. This results in jerky motion and affects the bearings' life. The supply line may experience a surge or sag due to the operation of other equipment on the same line. If the motor is not protected from such conditions, it will be subjected to higher stress than designed for, which ultimately may lead to its premature failure. All of the previously mentioned problems, faced by both consumers and the industry, strongly advocated the need for an intelligent motor control. The frequency inverter is a system made up of active/passive power electronics devices (IGBT, MOSFET, etc. ), a high speed central controlling unit (a microcontroller, like the PIC18 or the PIC16) and optional sensing devices,depending upon the application requirement. The basic function of the frequency inverter is to act as a variable frequency generator in order to vary speed of the motor as per the user setting. The rectifier and the filter convert the AC input to DC with negligible ripple. 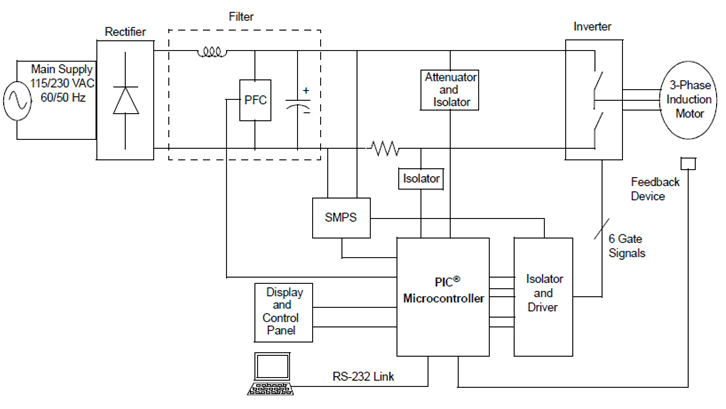 The inverter, under the control of the PIC micro microcontroller, synthesizes the DC into three-phase variable voltage, variable frequency AC. Additional features can be provided, like the DC bus voltage sensing, OV and UV trip, overcurrent protection, accurate speed/position control, temperature control, easy control setting, display, PC connectivity for real time monitoring, Power Factor Correction (PFC) and so on. With the rich feature set of the PICmicro microcontroller, it is possible to integrate all the features necessary into a single chip solution so as to get advantages, such as reliability, accurate control, space saving, cost saving and so on. A typical modern age intelligent frequency inverter for the three phase induction motor with single phase supply is shown in Figure 20. The base speed of the motor is proportional to supply frequency and is inversely proportional to the number of stator poles. The number of poles cannot be changed once the motor is constructed. So, by changing the supply frequency, the motor speed can be changed. But when the supply frequency is reduced, the equivalent impedance of electric circuit reduces. This results in higher current drawn by the motor and a higher flux. If the supply voltage is not reduced, the magnetic field may reach the saturation level. Therefore, in order to keep the magnetic flux within working range, both the supply voltage and the frequency are changed in a constant ratio. Since the torque produced by the motor is proportional to the magnetic field in the air gap, the torque remains more or less constant throughout the operating range. As seen in Figure 21, the voltage and the frequency are varied at a constant ratio up to the base speed. The flux and the torque remain almost constant up to the base speed. Beyond the base speed, the supply voltage can not be increased. Increasing the frequency beyond the base speed results in the field weakening and the torque reduces. Above the base speed, the torque governing factors become more nonlinear as the friction and wind age losses increase significantly. Due to this, the torque curve becomes nonlinear. Based on the motor type, the field weakening can go up to twice the base speed. This control is the most popular in industries and is popularly known as the constant V/f control. By selecting the proper V/f ratio for a motor, the starting current can be kept well under control. This avoids any sag in the supply line, as well as heating of the motor. The frequency inverter also provides overcurrent protection. This feature is very useful while controlling the motor with higher inertia. Since almost constant rated torque is available over the entire operating range, the speed range of the motor becomes wider. User can set the speed as per the load requirement, thereby achieving higher energy efficiency (especially with the load where power is proportional to the cube speed). Continuous operation over almost the entire range is smooth, except at very low speed. This restriction comes mainly due to the inherent losses in the motor, like frictional, windage, iron, etc. These losses are almost constant over the entire speed. Therefore, to start the motor, sufficient power must be supplied to overcome these losses and the minimum torque has to be developed to overcome the load inertia. The PFC circuit at the input side of the frequency inverter helps a great deal to maintain an approximate unity PF. By executing a complex algorithm in real-time using the PICmicro microcontroller, the user can easily limit flow of harmonics from line to motor and hence, near unity PF power can be drawn from the line. By incorporating the proper EMI filter, the noise flow from the frequency inverter to the line can entirely be stopped. As the frequency inverter is in between the supply line and the motor, any disturbance (sag or surge) on the supply line does not get transmitted to the motor side. With the use of various kinds of available feedback sensors, the frequency inverter becomes an intelligent operator in truesense. Due to feedback, the frequency inverter will shift motor torque speed curve, as per the load and the input condition.This helps to achieve better energy efficiency. With the frequency inverter, the true four quadrant operation of the motor is possible (i.e., forward motoring and braking,reverse motoring and braking). This means that it eliminates the need for mechanical brakes and efficiently reuses the Kinetic Energy (KE) of the motor. However, for safety reasons, in many applications like hoists and cranes, the mechanical brakes are kept as a standby in case of electrical brake failure. Care must be taken while braking the motor. 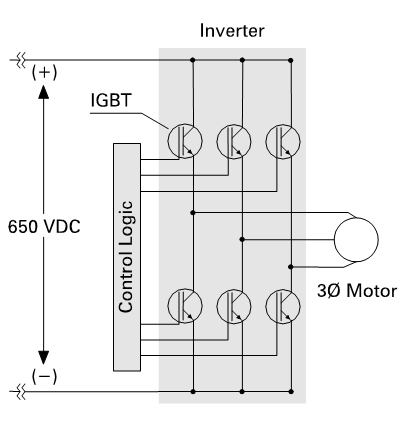 If the input side of the frequency inverter is uncontrolled, then regenerative braking is not possible (i.e., the KE from the motor cannot be returned back to the supply.) If the filter DC link capacitor is not sufficiently large enough, then the KE, while braking, will raise the DC bus voltage level.This will increase the stress level on the power devices as well as the DC link capacitor. This may lead to permanent damage to the device/capacitor. It is always advisable to use the dissipative mean (resistor) to limit the energy returning to the DC link by dissipating a substantial portion in the resistor. Compared to the mechanical braking, the electrical braking is frictionless. There is no wear and tear in the electrical braking. As a result, the repetitive braking is done more efficiently with the electrical braking. Constant Power Region intelligent frequency inverter at such an inexpensive rate that the investment cost can be recovered within 1 to 2 years, depending upon the features of frequency inverter. Let us have a look at the classical case of the centrifugal pump and how the use of the frequency inverter provides the user the most energy efficient solution at a low cost. 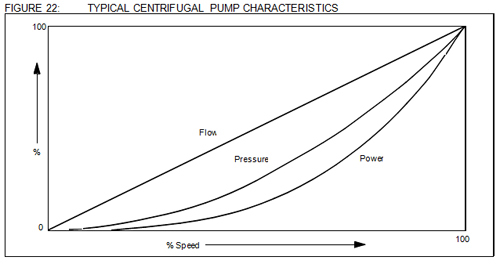 Any centrifugal pump follows the Affinity laws, which are represented in terms of the curves shown in Figure 22. Let us say that the user wants a centrifugal pump for water flow of 100 gallons/minute for a pressure head of50 feet continuously and occasionally needs a peak flow of 200 gallons/minute. The curves of load and pump are as shown in Figure 23. It can be observed that for an occasional peak requirement of 200 gallons/minute, the user is forced to go for an over designed pump, which means higher investment cost. Also, if the pump is run directly with supply, without any control of flow, the pump continuously runs at a speed higher than required. This translates into more power input to the pump (Affinity laws) and hence a higher energy bill. Also, the user does not have any control overflow. For years, to control flow, the throttle value was implemented. Closing this mechanical part partially, to regulate the flow, shifts the operating point to the left of the curve and increases the pressure head (as shown in Figure 23). But it adds to the frictional loss and the overall system loss. With continuous frictional loss,the heating of the valve takes place, which brings down it's life considerably. 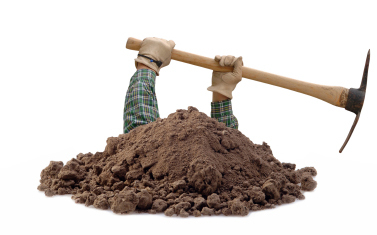 The maintenance cost of the valve adds to the operating cost of the pump. An increase in the pressure head means higher power input, which further increases the energy loss. With use of the frequency inverter, users can avoid all of the previously mentioned problems. First, the frequency inverter can adjust the speed of the pump to a new required speed in order to get the needed flow. This process is like replacing the present pump with the new pump having modified characteristics (as shown in Figure 23). Reduction in the speed means reduction in the pressure head and reduction in the power consumption; no frictional loss and hence no maintenance cost. The difference in the pressure head (as shown in Figure 23) due to the operating points of the pump, with and without the frequency inverter, leads to almost an 85% savings in energy. This implies that there is no need to over design the pump and a pump of lower rating can be installed (lower investment cost). An occasional need for higher flow can be taken care of by the frequency inverter. Running the pump at an overrated speed by the field weakening can meet the higher load requirement. In this type of control, the motor is fed with variable frequency signals generated by the PWM control from an inverter using the feature rich PICmicro microcontroller. Here, the V/f ratio is maintained constant in order to get constant torque over the entire operating range. Since only magnitudes of the input variables frequency and voltage are controlled, this is known as "scalar control". Generally, the frequency inverters with such a control are without any feedback devices (open loop control). Hence, a control of this type offers low cost and is an easy to implement solution. In such controls, very little knowledge of the motor is required for frequency control. Thus, this control is widely used. A disadvantage of such a control is that the torque developed is load dependent as it is not controlled directly. Also, the transient response of such a control is not fast due to the predefined switching pattern of the inverter. 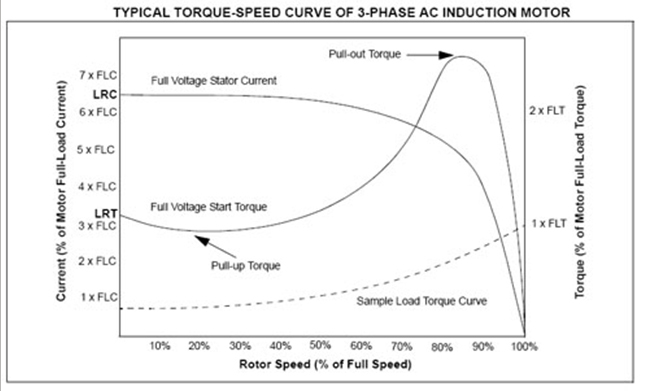 However, if there is a continuous block to the rotor rotation, it will lead to heating of the motor regardless of implementation of the overcurrent control loop. By adding a speed/position sensor, the problem relating to the blocked rotor and the load dependent speed can be overcome. However, this will add to the system cost,size and complexity. There are a number of ways to implement scalar control. The popular schemes are described in the following sections. In this method, the sinusoidal weighted values are stored in the PICmicro microcontroller and are made available at the output port at user defined intervals. The advantage of this technique is that very little calculation is required. Only one look-up table of the sine wave is required, as all the motor phases are120 electrical degrees displaced. The disadvantage of this method is that the magnitude of the fundamental voltage is less than 90%. Also, the harmonics at PWM switching frequency have significant magnitude. The inverter of the frequency inverter has six distinct switching states. When it is switched in a specific order, the threephase AC induction motor can be rotated. The advantage of this method is that there is no intermediate calculation required and thus, is easiest to implement. Also, the magnitude of the fundamental voltage is more than the DC bus. The disadvantage is higher low order harmonics which cannot be filtered by the motor inductance. This means higher losses in the motor, higher torque ripple and jerky operation at low speed. This control technique is based on the fact that three phase voltage vectors of the induction motor can be converted into a single rotating vector. Rotation of this space vector can be implemented by frequency inverter to generate three-phase sine waves. The advantages are less harmonic magnitude at the PWM switching frequency due to averaging, less memory requirement compared to sinusoidal PWM, etc. The disadvantages are not full utilization of the DC bus voltage, more calculation required, etc. Implementation of SVMPWM with over modulation can generate a fundamental sine wave of amplitude greater than the DC bus level. The disadvantage is complicated calculation, line-to-line waveforms are not "clean" and the THD increases, but still less than the THD of the six-step PWM method. As the torque producing component in this type of control is controlled only after transformation is done and is not the main input reference, such control is known as indirect torque control. The most challenging and ultimately, the limiting feature of the field orientation, is the method whereby the flux angle is measured or estimated. Depending on the method of measurement, the vector control is divided into two subcategories: direct and indirect vector control. In direct vector control, the flux measurement is done by using the flux sensing coils or the Hall devices. This adds to additional hardware cost and in addition, measurement is not highly accurate. Therefore, this method is not a very good control technique. The more common method is indirect vector control. In this method, the flux angle is not measured directly, but is estimated from the equivalent circuit model and from measurements of the rotor speed, the stator current and the voltage. One common technique for estimating the rotor flux is based on the slip relation. This requires the measurement of the rotor position and the stator current. With current and position sensors, this method performs reasonably well over the entire speed range. The most high-performance frequency inverters in operation today employ indirect field orientation based on the slip relation. The main disadvantage of this method is the need of the rotor position information using the shaft mounted encoder. This means additional wiring and component cost. This increases the size of the motor. When the frequency inverter and the motor are far apart, the additional wiring poses a challenge. To overcome the sensor/encoder problem, todays main research focus is in the area of a sensorless approach. The advantages of the vector control are to better the torque response compared to the scalar control, full-load torque close to zero speed, accurate speed control and performance approaching DC drive, among others. But this requires a complex algorithm for speed calculation in real-time. Due to feedback devices, this control becomes costly compared to the scalar control. The difference between the traditional vector control and the DTC is that the DTC has no fixed switching pattern. The DTC switches the inverter according to the load needs. Due to elimination of the fixed switching pattern (characteristic of the vector and the scalar control), the DTC response is extremely fast during the instant load changes. Although the speed accuracy up to 0.5% is ensured with this complex technology, it eliminates the requirement of any feedback device. 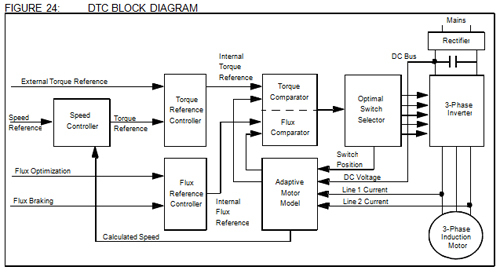 The block diagram of the DTC implementation is shown in Figure 24. The heart of this technology is its adaptive motor model. This model is based on the mathematical expressions of basic motor theory. This model requires information about the various motor parameters, like stator resistance, mutual inductance, saturation coefficiency, etc. The algorithm captures all these details at the start from the motor without rotating the motor. But rotating the motor for a few seconds helps in the tuning of the model. The better the tuning, the higher the accuracy of speed and torque control. With the DC bus voltage, the line currents and the present switch position as inputs, the model calculates actual flux and torque of the motor. These values are fed to two-level comparators of the torque and flux, respectively. The output of these comparators is the torque and flux reference signals for the optimal switch selection table. Selected switch position is given to the inverter without any modulation, which means faster response time. The external speed set reference signal is decoded to generate the torque and flux reference. Thus, in the DTC, the motor torque and flux become direct controlled variables and hence, the name Direct Torque Control. The advantage of this technology is the fastest response time,elimination of feedback devices, reduced mechanical failure, performance nearly the same as the DC machine without feedback, etc. The disadvantage is due to the inherent hysteresis of the comparator, higher torque and flux ripple exist. Since switching is not done at a very high frequency, the low order harmonics increases. It is believed that the DTC can be implemented using an Artificial Intelligence model instead of the model based on mathematical equations. This will help in better tuning of the model and less dependence on the motor parameters.